CHICAGO — Beth Kosson has no problem calling red-winged blackbirds "nature's a-------." "They always remind me of hard old-timey Jersey couples," said Kosson, an environmental science consultant and DePaul graduate. "The female will sit there on the nest and then the male tries to muscle out the humans — the whole time the female is watching, egging on her man. 'Get 'em, baby. Get 'em good.' Bunch of a------- they are." If you're walking, jogging or riding a bike anywhere in Chicago this spring or summer, don't be surprised if you see the black bird with red and yellow wings flying right at you. The aggressive birds, protecting their nests, are commonly known to swoop down on humans, and even try to grab their hair. Red-winged blackbirds are among the most abundant birds in North America. They can be routinely found near waterways and marshes, especially atop cattails, and on telephone wires. Males have the red and yellow shoulders, which they puff when feeling particularly boastful. Females are more brown colored. Sr. Editor Justin Breen has had his own run-ins with the red-winged blackbird. The attacks aren't a new problem. 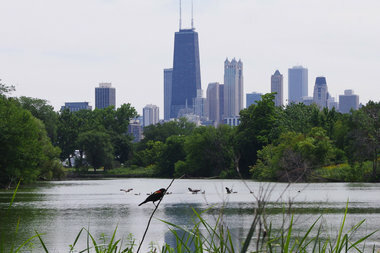 In 2013, red-winged blackbirds terrorized visitors to Grant Park. The Tribune in 1999 called lakefront jogging a "contact sport" after several red-winged blackbirds zeroed in on unsuspecting runners. "My experience is that they'll scare the heck out of you, but they usually won't hit you," John Bates, assistant curator at the Field Museum of Natural History, told the Tribune in 1999. Kosson said runners should be aware of the red-winged blackbirds on their paths. Above all, though, she said to "always stand your ground." "Don't take any of their crap," she said.